Boom Boom! Classics! contains ten simple and effective arrangements of classic themes from all-time great composers that will give students a fun way to learn about and perform classical music. 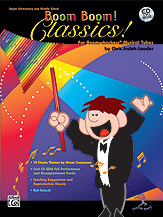 A CD is included with rhythm band accompaniments and full performance with Boomwhackers® for each selection. It provides the student with musical concepts and a terrific accompaniment for performance. Opportunities to incorporate movement and other Orff instruments into the lessons are outlined by the author in her teaching suggestions for each piece. Contains: Turkish March * Hungarian Dance No. 5 * Slavonic Dance, Op. 46, No. 7 * Spinning Song * Theme from The Merry Widow * Rondeau Theme from Symphonic Suite No. 1 * Hopak * Can-Can * William Tell Overture * Theme from "The Trout" Quintet.